The Sleeping Doll is Jeffery Deaver's first thriller novel in the Kathryn Dance series. Kathryn Dance's character is an expert interrogator and body-language analyst for the FBI. When a serial killer named Daniel Pell escapes from prison, the FBI suspects that Pell is after a girl known as "The Sleeping Doll," the only survivor left from the family Pell slaughtered years ago. Having belonged to a cult and committed a murder in the style of Charles Manson, Kathryn Dance must use her knowledge about Pell to track him down throughout central California. 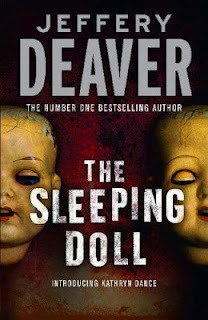 Just like the rest of Deaver's novels, The Sleeping Doll has its full share of red herrings and plot twists. Additionally, numerous pop-culture references and descriptions of the Carmel, California region lend extra vibrancy to the tone of this very dark thriller. Chapters comprised of Daniel Pell's thoughts are blended tastefully throughout this novel, giving readers a glimpse of Pell's sick and twisted mind. Deaver's research into the mannerisms and profiles of serial killers is evident through much of The Sleeping Doll, which will only add to the value of your reading experience with this novel. Although I've read hundreds upon hundreds of mysteries both for work and pleasure, Deaver never fails to surprise me with his unpredictable twists. This series' debut is a great introduction to kinesics expert Kathryn Dance! Check out these other novels in the Kathryn Dance series, as well as Jeffery Deaver's latest standalone novels: The Bodies Left Behind and Edge. Who are your favorite thriller novelists? What are your favorite Jeffery Deaver titles? Share your thoughts with us in the comments section below.